I love this time of year as the temperature drops & the leaves start to change. 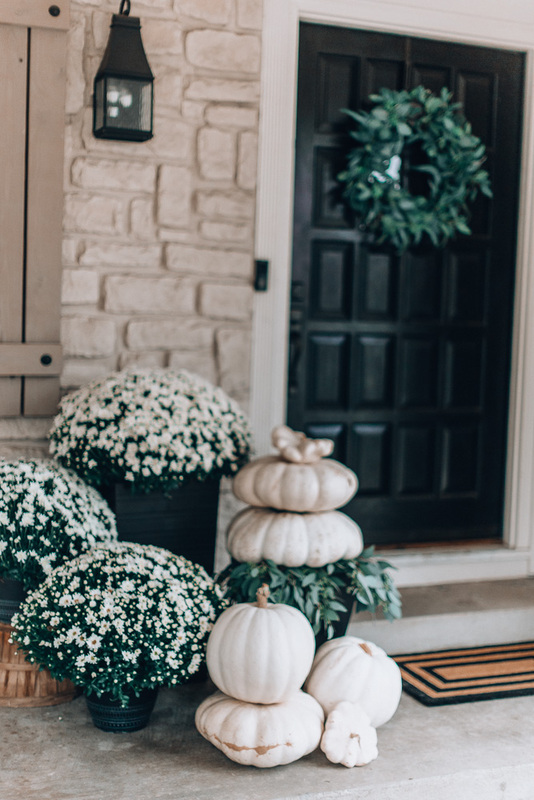 This week I decorated our home for Fall and it feels so good! 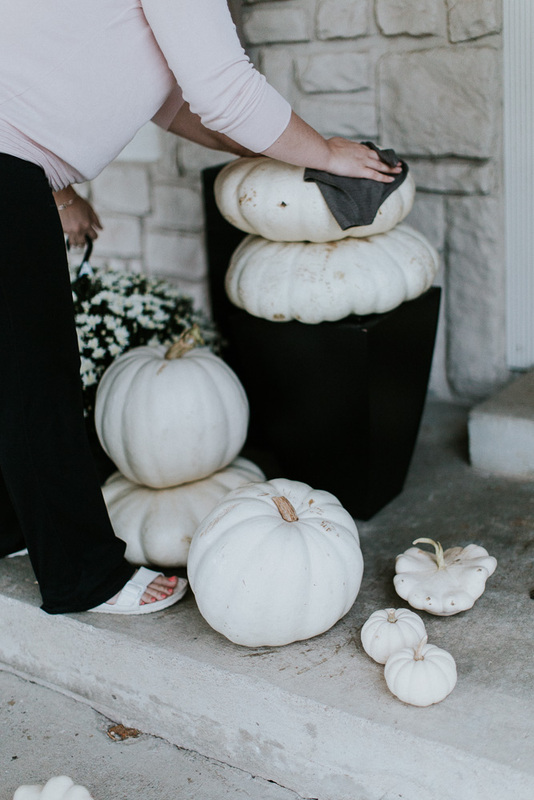 Today I’m sharing my Fall decor and some tips for both indoor and outdoor decorating to give you some ideas on how to decorate your home for fall! Some years I like to stay in my color scheme and use non-traditional colors for a very traditional holiday. 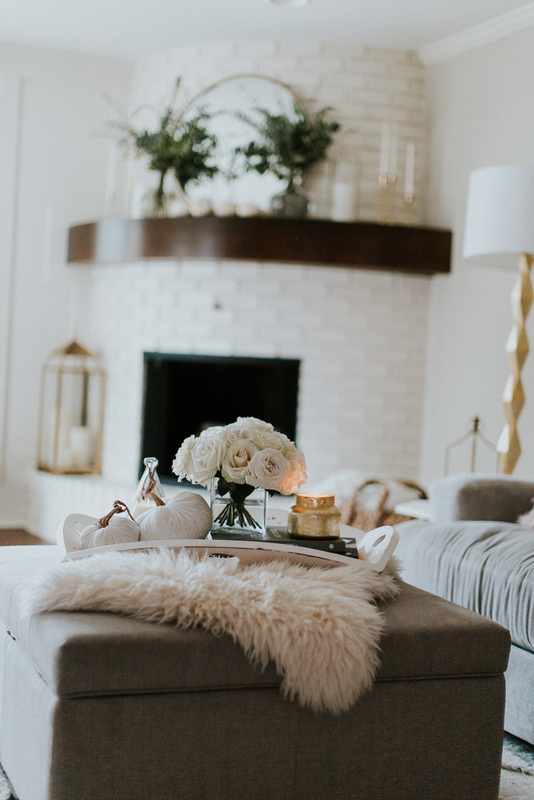 For Fall I wanted to continue with my neutral vibe in my family room, so I added fresh muted greens in place of bold warm colors. I love using fresh flowers in my home decor. 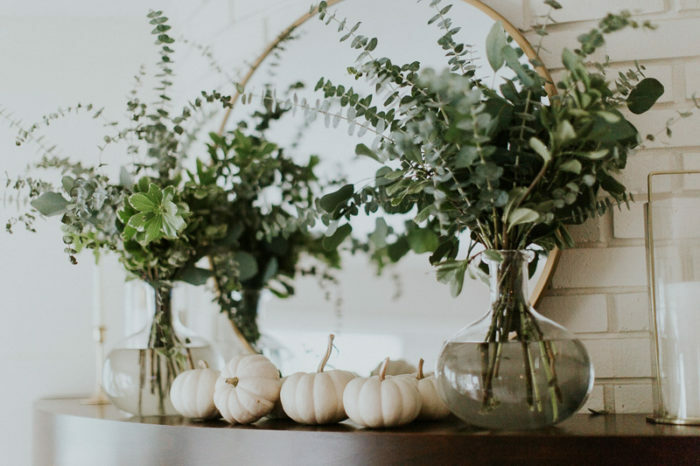 This year for Fall I chose to use different types of eucalyptus to fill these belly glass vases. I also love to bring real (little) pumpkins inside, instead of just putting them outside. 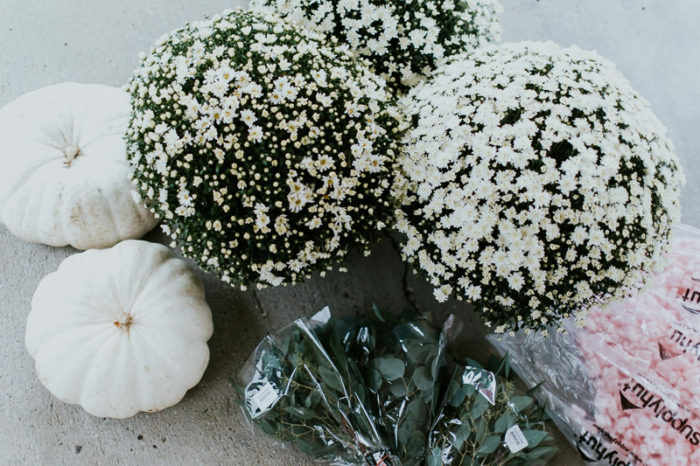 Pumpkins seem to be everywhere you go in late September so next time you stop at your local store either pick up a handful of small white pumpkins or a mix of differently shaped gourds. 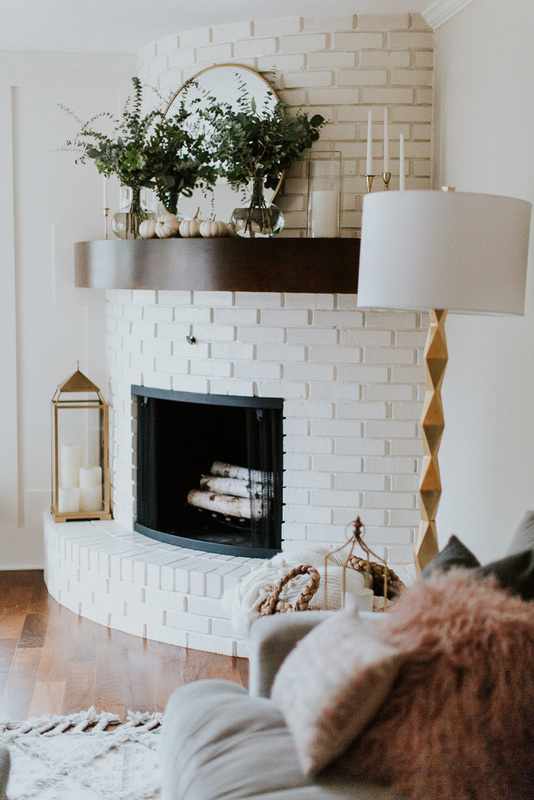 Adding a real element to any of your home decor is one of my favorite additions. Instead of focusing just on adding Fall colors, don’t forget to add Fall textures too. 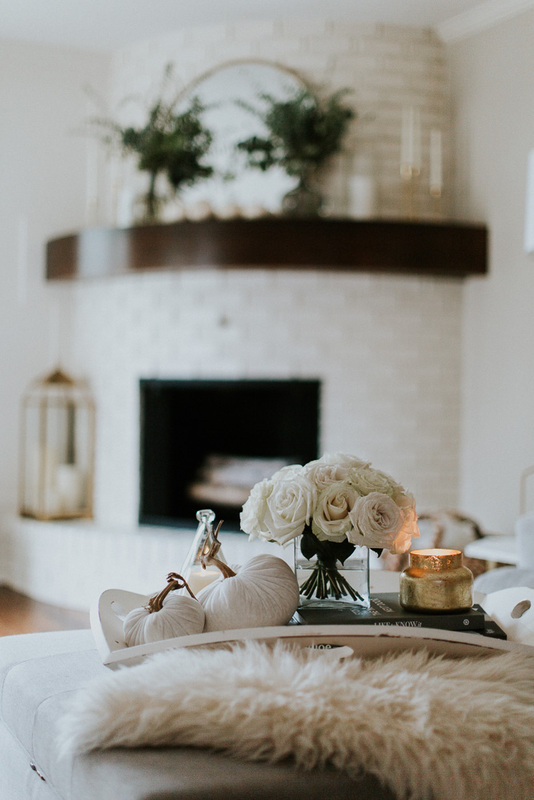 Create the feeling of coziness by using thick knits, velvet pillows, and chunky throws. I love placing blankets in a giant basket right next to our fireplace during the Fall & Winter months. 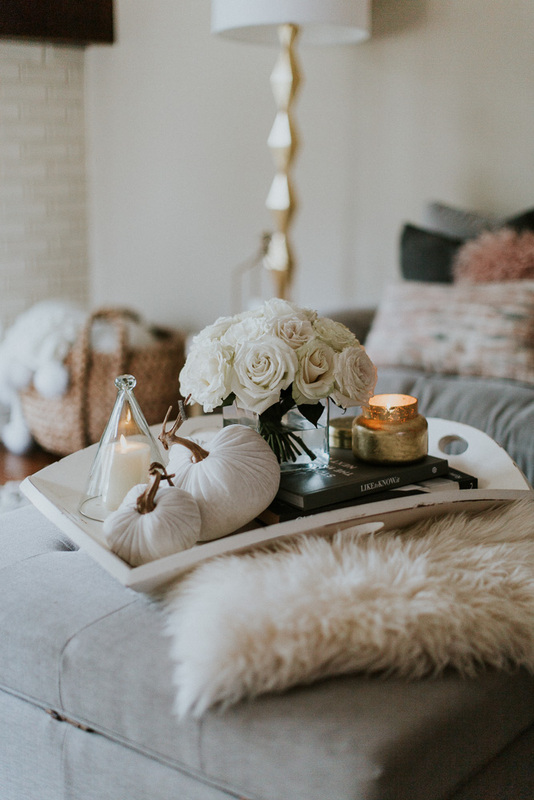 Burning a Fall candle can really set the ambiance of a room. I love burning a candle in each room, (well when Greyson is not around) it really makes it feel like fall. 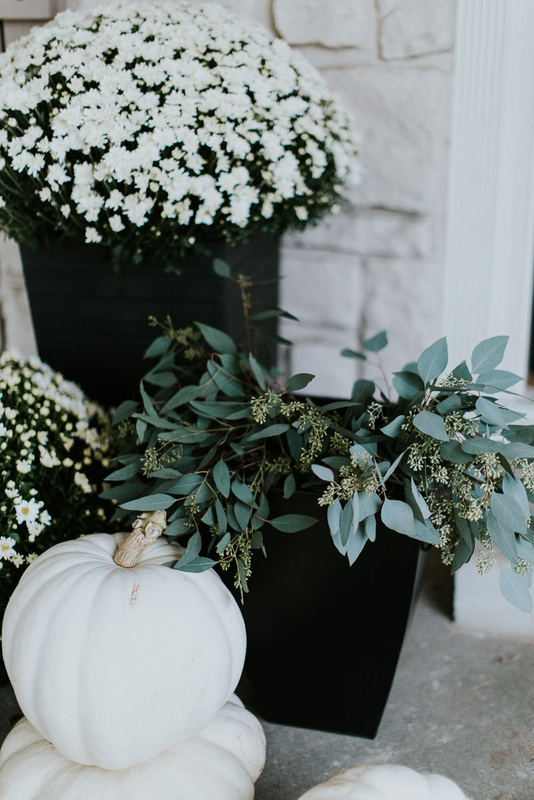 Also, the containers are always so beautiful sitting around to add to your fall decor. We had the best time at the pumpkin patch picking out pumpkins & mums. 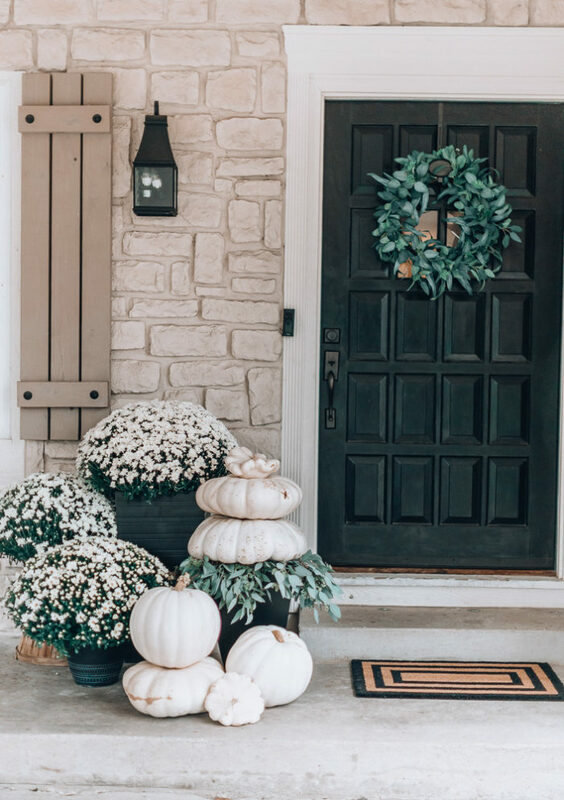 For our front porch I chose to use all white pumpkins, and on the back patio, the kids have an assortment of other pumpkins that they picked. We’ve already carved a few too! 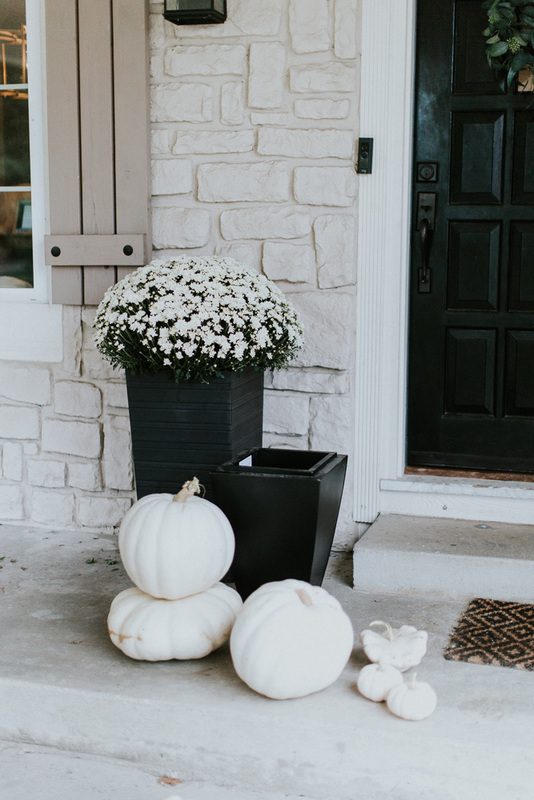 Using different sizes of planters & pumpkins helps to create layers & visual depth. 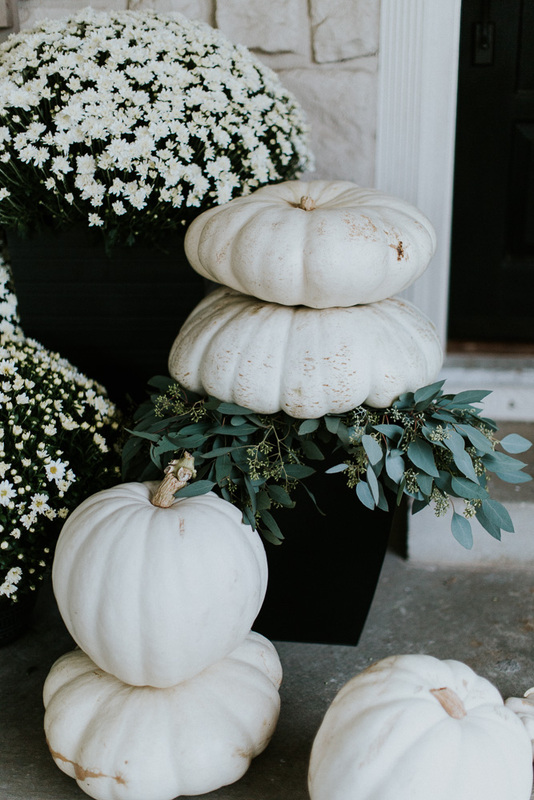 I love the flat pumpkins to establish varying heights with pumpkin stacks. Just like in decorating inside, the rule of 3’s applies here (or any odd number). 3 objects at varying heights & depths is key to making an appealing & memorable visual experience. Just like I love adding fresh flowers & greens into my home, I love adding fresh pieces outside too. While the mums & pumpkins are obviously fresh, the eucalyptus sticking out of the planter brings in a unique element providing different colors & textures. And when it dries it still looks beautiful and very “Fall”. My Spring & Summer wreaths are very “fresh” green. For Fall, I like to put up a more muted green wreath. 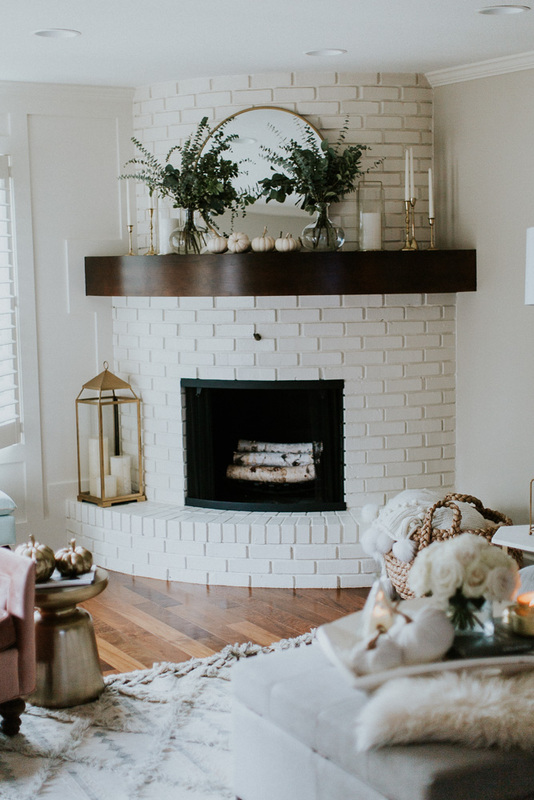 The eucalyptus wreath also ties in well with the eucalyptus in the planter on the porch and also continues into my family room with the eucalyptus on the mantle. 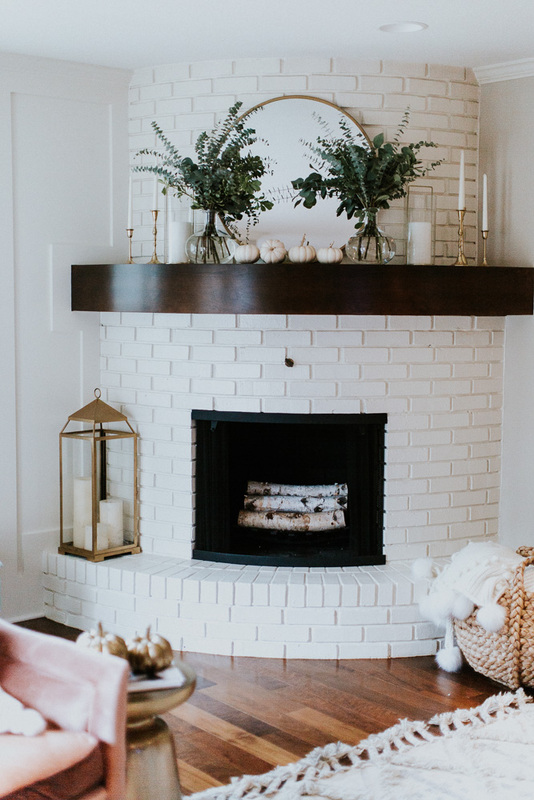 It’s fun to have a common theme or element throughout all your seasonal decor. 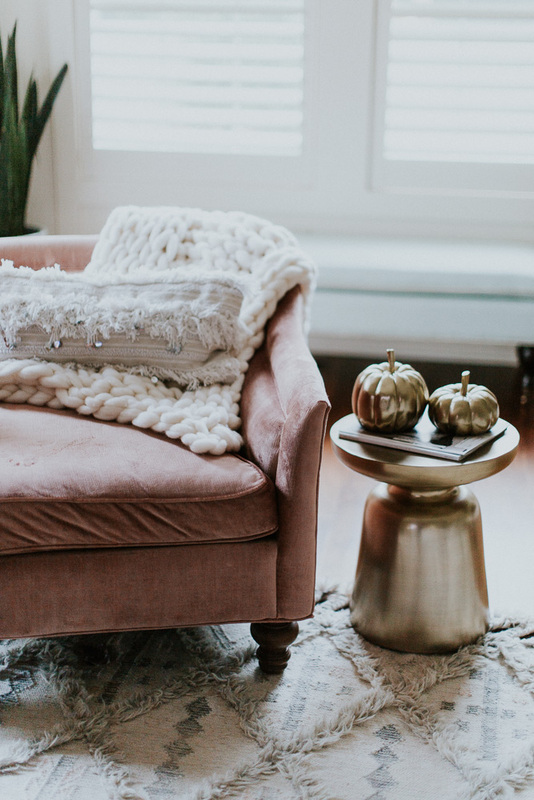 Hope this gave you some ideas on how to decorate your home for fall! Thanks for stopping by! 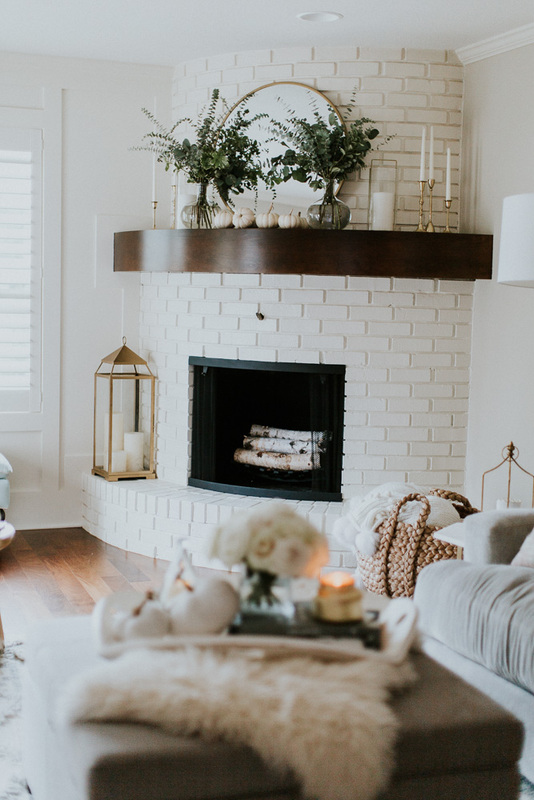 For a full living room tour and more home decor ideas (furniture sources included), see this post. Great post! Your decorations are gorgeous and so chic. I go the opposite way and do full halloween decor. Hi!! 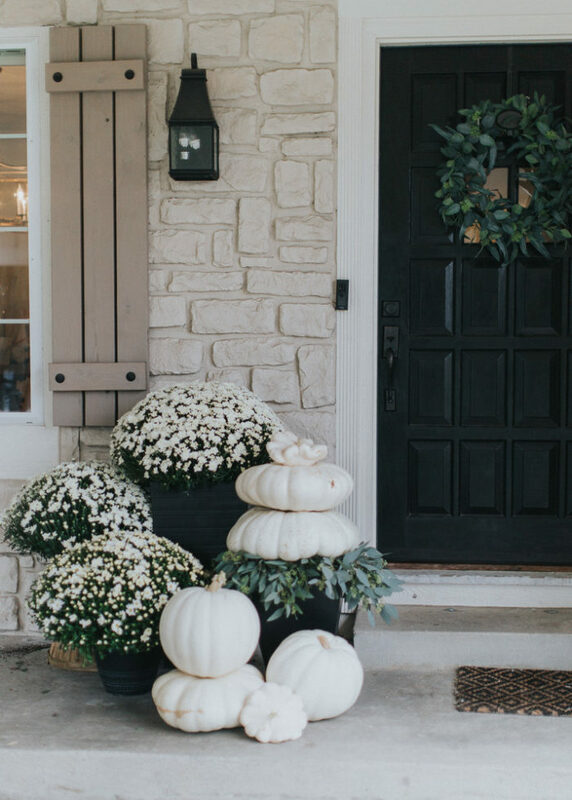 I am in the Kansas City area and was curious where you found your white pumpkins and white mums! Love the blog! I found the pumpkins at Johnson Family Farms! The mums there had not bloomed so I got the mums at Home Depot!